One of the recurrent, defining strands of British and European politics over the last decade has been the crisis of regulation. Banks, horsemeat, cladding. At the risk of putting it slightly grandiloquently: these are the grounds over which is fought, decade-in, decade-out, the central internal conflict at the heart of the neoliberal state – a state that wishes to will parts of itself out of existence, the Leviathan that wants to decapitate itself. It’s always an interesting exercise, therefore, to peer back in time to an age before a body of regulation existed. Before the Export Control Act, or the Food Standards Agency, or the Basel Committee. Whenever I do this, I’m often struck not by how different political and bureaucratic struggles look, but how similar. Yesterday I was at the National Archives in London, looking for something else entirely. But it happened to be the day when this year’s raft of new Foreign Office files – in this case mainly from 1986 — were declassified and placed in the archives. (Hence yesterday’s traditional bevy of “30-years’-rule” media stories about letters to Margaret Thatcher and the imprisonment of Nazis). I had a (very) quick skim. The mid-1980s was a period in which the international arms trade – especially during the Iran/Iraq war – saw excesses that ultimately prompted scandal-ridden governments in the 1990s to set up the current framework of European conventional arms trade controls. This has two planks: on the one hand, the bureaucratic machinery of national export control organisations and comprehensive trade licensing requirements, established in the UK under the 2002 Export Control Act, born out of the Lord Justice Scott’s 1996 “Arms to Iraq” inquiry; and on the other, the regulatory principle that governments should formally assess applications to export weapons against a defined set of risks of their diversion or misuse, first in the 1998 EU Code of Conduct on Arms Exports, and then in a raft of EU Council Decisions and publicly-stated export criteria. Neither existed in 1980s Britain. Instead, as the Scott Inquiry showed, the government enjoyed expansive executive discretion to regulate arms exports under a vague set of powers legislated hastily in 1939 and intended at the time to be temporary; plus an inter-departmental blancmange of experts and working groups to advise on licensing decisions, characterised essentially by informality and secrecy. The situation was little different in many other European countries. In no particular order, therefore: two postcards from the land that export controls forgot. IMS here refers to International Military Sales Ltd, then the government-owned sales wing of the MOD. There’s no indication in the files whether the UK government ever confirmed if some of these 155mm artillery pieces had indeed ended up in Iraq or not: and to this day many analysts’ inventories of the Saudi armed forces lists a full complement of 72 FH-70s. Either way, these diversion concerns, and the Saudi refusal to allow post-export verification, evidently didn’t deflate British efforts to continue supplying both land and air weapons systems of all kinds to Saudi Arabia during the 1980s — including (unsuccessful) efforts to sell more FH-70s. And these days? Well, life’s surely very different in 2017 for European export control authorities concerned about the diversion of weapons exported to the Gulf…Beyond the geographical and political similarities, though, thirty years on there’s a very familiar shape to the regulatory discussion that precisely mirrors debates over arms diversion today: doubts over the enforceability of end-user controls and no-re-export clauses, which the UK government continues to resist in binding format; anxiety about trespassing on national sovereignty to ask for post-shipment inspection; conflicts between commercial exigency and the reputability of one’s customer. At least in theory, German arms export policy has historically shown greater circumspection than some other European countries in exporting weapons to the Middle East. In the 1970s, the German cabinet had formulated a set of confidential policies prohibiting arms sales to countries in “areas of tension”, generally taken to include much of the Middle East, an assumption bound up tacitly in German post-war concerns about its weapons being used against Israel. Though these policies were loosened in 1982, the Bundestag and elements of all political parties remained touchy, effectively derailing Helmut Kohl’s attempt to sell Leopard II tanks to Saudi Arabia in the mid-1980s, for instance. 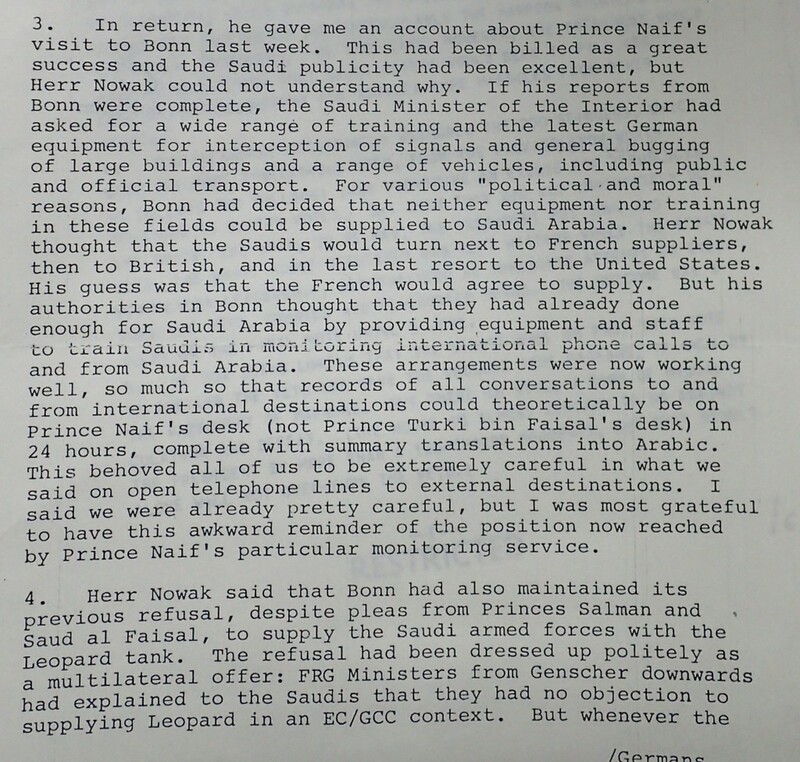 So it’s intriguing to see this gossipy note [full pdf] on the British ambassador’s conversation with the German ambassador to Saudi Arabia in late 1986. There’s no guarantee that it’s accurate — if it is, though, it sheds light on an area where Germany may have had fewer scruples. Fast-forward. One of the biggest export control debates in the last five years has been whether export controls can and should cover surveillance technology – particularly communications interception technology for emails and phone apps. Until recent years, ‘control lists’ of export-controlled military and dual-use hardware and software, like those of the 41-country Wassenaar Arrangment, did didn’t include much ‘civilian’ surveillance tech. Researchers have fingered German companies as major players in the surveillance tech industry – accusations which, in part, prompted Germany to introduce new export controls in this area in July 2015, ahead of measures in the European Union. The European Commission drafted a proposal last year for new EU-wide controls on cyber-surveillance tech exports, but these still won’t require risk assessments against the risk that exports will be used for internal repression or human rights violations as extensive or as binding as those covering arms exports. Thirty years on, despite some development in European regulation of surveillance tech, the distinction in moralpolitik remains in place between being shelled by a European-made tank, or arrested thanks to a European-provided phone tap. In part, of course, these dilemmas look similar thirty years apart because they’re in some senses intrinsic to the arms and security trade: a business always prone to calibrations of politico-commercial advantage and ethical restraint, complicity and sovereignty. (And what I’ve presented above is a superficial skim-read of particular documents, not any kind of serious historical reconstruction of decision-making as recorded in the files). From the snippets alone, though, it’s nonetheless striking that — despite thirty years of regulatory development in European arms and security export controls — the outcomes of these dilemmas are broadly the same then and now: reticence over enforcing end-use controls on sovereign buyers; anxious tolerance of Saudi weapons diversions into Iraq (then) or Syria (now); greater latitude for snooping devices than shooting devices. I think this says something about the limitations of regulatory principles and machinery when it comes to the arena of risk. Except for arms embargoes, export controls don’t mandate absolutely what can be exported and to whom. They establish a system for officials to make assessments of the risks of certain outcomes from exports, and licensing decisions based on that risk assessment. For all the assessment criteria and decision-trees, it’s the nature and quality of those decisions that is, in the end, determinative. Not that regulatory principles and machinery aren’t absolutely necessary – they make sure that risk assessments get made at all; and they can help make sure that they get made well. But they aren’t sufficient. Decisions, in the end, often outweigh regulatory frameworks. And decision-makers are often in place a long time. Famously, in the case of dynastic regimes like Saudi Arabia: Prince Sultan bin Abdulaziz al Saud, the Saudi defence minister who oversaw arms purchases from the UK, was in post for 48 years, from 1963 until his death in 2011. But also, though less remarked-upon, in the case of western bureaucracies: though UK ministers change more regularly, their civil servants also have considerable longevity. 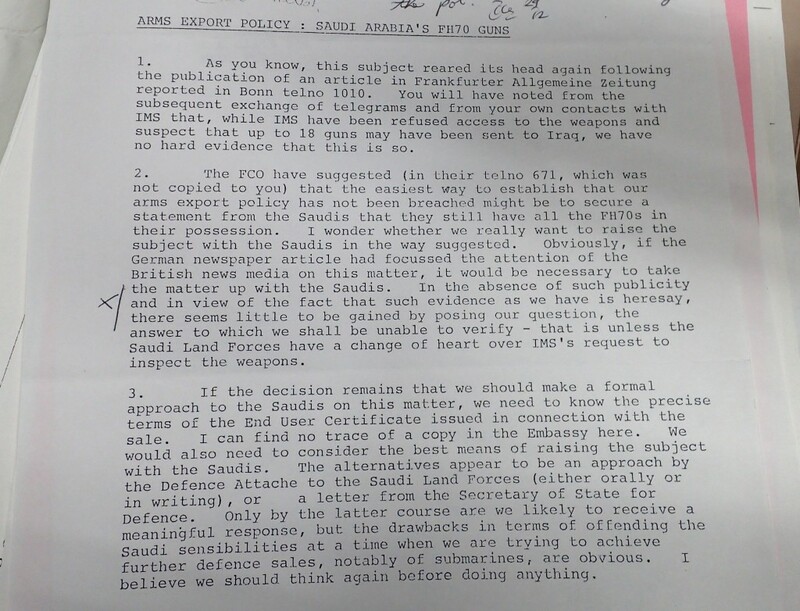 Tom McKane, the author of the ‘let sleeping dogs lie’ note detailed above about allegations of Saudi arms diversion to Iraq, was in 1986 posted by the UK MOD to the British Embassy in Riyadh. Thirty years on, he is now overall head of the UK Saudi Armed Forces Project (MODSAP), the UK MOD unit that overseas the UK’s arms sales programme with Saudi Arabia. The nature and quality of arms export regulation in the UK has recently been tested very publicly. In February the High Court reviewed the UK government’s decision to continue exporting military aircraft, air and naval weapons to Saudi Arabia throughout the Yemen conflict, and found this decision lawful. The Court’s judgement, published this month, seems perverse to many commentators: that authorising arms exports to a combatant force that has publicly declared whole cities military targets, used cluster munitions in civilian areas, deliberately bombed the unloading cranes at a civilian port and imposed a naval blockade that a UN Special Rapporteur argues has contributed to a civilian famine of seven million people, can be entirely consistent with an unambiguous prohibition in UK and EU arms control policy on exporting weapons where there exists “a clear risk that the items might be used in the commission of a serious violation of international humanitarian law”. The decision [to allow or refuse continued arms exports to Saudi Arabia] involved balancing a series of complex and competing factors. Such self-evidently finely balanced judgements are paradigm matters for evaluation and decision by the Executive in conformity with the scheme established by Parliament. They are, of course, subject to scrutiny in the High Court, but with a suitable recognition of the institutional competence of those charged with the decision-making process. So it is in this case. The Claimant appeared at one stage to suggest that because the Government themselves considered the decision to be finely balanced that would enable a Court more readily to interfere. On the contrary, in an area where the Court is not possessed of the institutional expertise to make the judgments in question, it should be especially cautious before interfering with a finely balanced decision reached after careful and anxious consideration by those who do have the relevant expertise to make the necessary judgements. The defence sales papers in the National Archives from 1986 don’t show much “anxious consideration”. But they do show essentially the same outcomes, thirty years ago, as decisions made today within a much more extensive and ‘anxious’ regulatory framework. If the public wants different outcomes in risk-based regulation, then it has to have other decision-makers, not just more elaborate regulation. (In this case, perhaps, Parliamentary decision-making over sensitive arms export applications?) If we want different outcomes, then the Leviathan can’t just agree to tie its own hands. Someone or something else has to hold them down. CORRECTION, 24 July: many thanks to a reader for pointing out that (i) the addition of surveillance tech to EU export controls remains a proposal, not a done deal; (ii) this proposal does institute a human rights risk assessment rule, but states have more latitude to disregard it when making the final export licensing decision, compared to the rules covering conventional arms exports. I’ve corrected these points above.